In this month’s edition of the Technology Solutions Guide series, CGT presents a comparison chart of supply chain planning providers to the consumer goods industry in 2017. 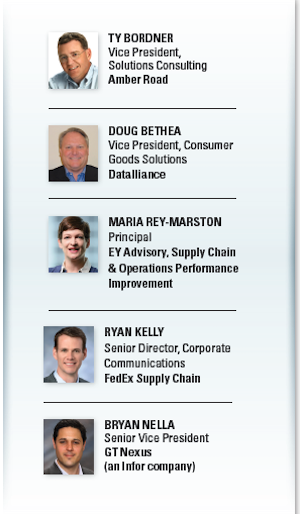 Plus, experts from sponsoring companies Amber Road, Datalliance, EY, FedEx Supply Chain and GT Nexus provide thought leadership for consumer goods manufacturers that are navigating the challenges and opportunities affecting the field of supply chain planning (click here to download the full PDF, including the comparison chart of solutions). CGT: What trends and challenges are elevating the prioritization of supply chain management in the consumer goods landscape? BORDNER: Whether it’s to access new developing markets or leverage low-cost labor, the globalization trend continues to drive a good portion of most corporate supply chain strategies. At the same time, the expansion of the Internet and the development of new apps effectively make the world a smaller place. This is also true in the global supply chain realm. New applications that allow companies to collaborate with their suppliers and other third parties across the globe are being leveraged to greatly increase productivity, achieve better planning and speed up the supply chain. I think many companies are looking for better ways to solve their global challenges and are just now discovering these relatively new software solutions — hence the recent increase in investment and priority. We’re certainly seeing an uptick in the demand for these types of solutions. BETHEA: We’re focused on helping CG suppliers and retailers maximize the performance of their interdependent, efficient supply chains to ultimately serve consumers who expect on-shelf availability every day. This goal can only be achieved if retailers and suppliers embrace the mission together through a highly collaborative approach. Key to success is a replenishment process that enables collaboration and visibility into consumer demand as it is happening — all the way through to proactively addressing product availability issues. Many CG suppliers and their retail partners are meeting this challenge via collaborative replenishment platforms. Together, they are seeing reduced out-of-stocks, less inventory, reduced costs, and high truck fill rates, delivering the right items in the right quantity at the right time. The best technology solutions support retailers that can send store demand signals (time-phased order forecasts), as well as other retailers that can only send store sales and inventory data to create the store demand signals. REY-MARSTON: Consumer goods companies have the unique opportunity to automate transactional decisions and drive more cognitive decision-making in the business while freeing up the valuable time of leaders in specific functions. As more data comes into operations from demand signals, context-aware apps, and internal data, there is a unique need to increase the power of the processing analytical engines to drive better business performance — not just more reports and more reactive analytics, but better support for real-time decision-making driven by technology. The connected environment, the sharing economy, and the cognitive world ultimately drive the need for superior technology in supply chain planning and execution. As we move into a more algorithmic-driven supply chain, the connection between analytics, IoT and AI creates a very powerful ecosystem of technology-powered response networks to drive profitable growth and unique customer experiences in the sector. The human role will change, from monitoring and managing repetitive transactions and tasks, to building the rules of engagement of the business, managing exceptions and designing unique strategies to build differentiation from a supply chain perspective. Another key trend shaping and prioritizing supply chain management in consumer goods is the sharing economy. These Uber-like models have the potential to un-constrain the capacity to respond to demand. We are experiencing companies using these models to source not only transportation but also manufacturing, labor in operations, procurement, and design of new products. When capacity is “unlimited” yet external, we will need a new breed of supply chain managers. KELLY: As e-commerce continues to grow, retailers are under increasing pressure to create a customer-centric supply chain — one that is highly transparent and nimble. Free and fast shipping and returns are at the top of the list of demands for consumers, and that impacts the profitability of retail operations. Consequently, those pressures are pushed upstream to manufacturers. Retailers now require better visibility into incoming inventory, which goes well beyond advanced shipment notifications: More and more, retailers demand real-time visibility into shipments, leaving manufacturers with a heavy investment in information technology infrastructure and supply chain management. Add product returns into the equation and the relationship between retailers and manufacturers can become even more complex, making it essential to have sophisticated visibility capabilities in place. NELLA: The challenge to carve out growth and profitability is driving industry leaders to penetrate new markets and reevaluate their product portfolios. Consolidation and reviews of product offerings continue to drive mergers and acquisitions. Consumer demand for variety and new products adds pressure for product innovation. More SKUs and packaging options create complexity in product development, sourcing, planning, production and fulfillment. All of these challenges require greater flexibility in the global supply chain. Unfortunately, common enterprise systems are rigid. Historically fragmented supply chain processes are obstacles to generating value in today’s marketplace. The pressure is on to transform the way consumer products are ordered, produced and delivered. CGT: With the growing emphasis on omnichannel, e-commerce and even direct-to-consumer sales, how can consumer goods companies leverage technology to better manage the planning and fulfillment processes? BORDNER: When we speak about e-commerce, omnichannel, and direct-to-consumer in the same sentence, the first thought that comes to mind is complexity and volume. Most organizations and supply chain structures are not set up to handle this today, especially as part of their global supply chain. Technology solutions can be used to help manage this complexity and increased shipping volume. Software applications provide better visibility to pertinent information at the right time, which allows supply chain practitioners to make faster and better decisions on the spot. In addition, many software applications can automate certain aspects of the supply chain, which is imperative to supporting the shipping volumes for direct-to-consumer and e-commerce. Companies cannot afford to hire people at the same proportion to the increased shipping volume. Although each company can have different needs, I think there is a lot of potential to use the same supply chain strategies and solutions to support e-commerce, omnichannel, and direct-to-consumer paradigms. BETHEA: Omnichannel and e-commerce are continuing to rapidly evolve, as evidenced by Amazon experimenting with a “click & collect” model in 2016 that will threaten several existing mass merchandiser and grocery models. There is no straightforward answer to how CG suppliers and retailers will need to change as these models gain steam, but what is clear is the need to adapt to these online demand signals as they grow in popularity. To date, many of these models have been addressed with existing store planning and replenishment processes. The demand signals driving the supply chain are captured alongside normal store demand. As these concepts accelerate, we expect to see retailers sharing online demand signals with their suppliers as they’re happening, so they’re both able to respond better. Planning for the future, replenishment solutions will need to accept this emerging external demand signal and integrate it into store/DC replenishment solutions. REY-MARSTON: Consumer-direct models and monitoring the actions of the omnichannel shopper provide the unique opportunity — for the first time in our lives, really — to build real-time demand curves. For the last three centuries, we operated under the paradigm of demand uncertainty; thus, all of our supply chain planning efforts focused on demand forecast- ing. The immediate connectivity with a shopper in action, in context and connected in real time allows companies the potential to capture demand signals and build real-time models to shape demand, to match demand with available capacity, to drive better fulfillment downstream, and to decide in a segmented way when and how to serve consumer/shopper/customer demand for better service experience and optimal, profitable growth. The partnership of supply chain and commercial strategy is fundamental to leveraging the ability to sense demand signals and drive profitable growth. That partnership involves the ability to quickly simulate and assess different service scenarios in real time and capture value from market opportunities while building customized shopper experiences. KELLY: Given the prevalence and complexities of executing an omnichannel strategy, laying the groundwork for predictive analytics is imperative for consumer goods companies. This is especially true for businesses looking to add drop-shipping capabilities for direct-to-consumer sales. In accordance with those trends, we’ve seen major consumer goods companies and retailers alike invest in drop shipping and e-commerce. To complement those efforts, companies can also turn to third-party logistics providers to enhance fulfillment capabilities, enable a broader go-to-market strategy and obtain the IT infrastructure for predictive analytics. Demand planning can then become more granular, allowing companies to break down demand by sales channel and location to improve the efficiency of their fulfillment operations. NELLA: Cloud technology and cloud-based networks provide the connectivity and visibility to fulfill demand and, more importantly, to do so profitably. When supply chain planning and execution are coupled together on a single network, manufacturers maintain a greater handle on inventory, costs, and customer service. The notion of “digital supply chain transformation” is rising to the top of the executive agenda for global industry leaders in consumer products. Digital transformation initiatives that approach the supply chain from a holistic view through the smart use of technology will be capable of addressing e-commerce challenges. CGT: Consumer goods companies are focused on leveraging data and insights through advanced analytics to make a difference throughout the supply chain. How are your customers incorporating new sources of data? BORDNER: Clearly, consumer buying patterns and other marketing data are being heavily leveraged by consumer goods companies today to both increase sales and profitability. In fact, the trend has been for this type of data and analysis to continue to be more specialized with increased correlation to other market data. The more specialized data that is available, the more insight can be gained. I don’t think web browser cookies are going away anytime soon. Our solutions are geared toward helping customers increase the productivity and speed of their global supply chains. In addition to helping improve supply planning processes and better execute cross-border supply chains, the resultant data is ripe for inclusion in advanced analytics tools and models. Including elements like supply chain event data, import duties, global transportation costs, free trade agreement info and other streams as part of the overall analytics process can prove invaluable. BETHEA: A key trend we are seeing is the growing importance of integrating store-level data upstream into the supplier’s supply chain, enabling visibility and responsiveness never before possible. This data, and the right forecast and replenishment analytics, provide insight into what stores will be ordering in the coming days so suppliers can anticipate demand pulls at the retailers’ DC, assess the impact on current DC inventory, and create the resulting orders that reflect what’s happening all the way to the shelf. Effectively, we see a multi-level collaborative replenishment process that is directly targeted at keeping the right inventory in stores and respective DC. The key is to anticipate and react to the best demand signal possible. To that end, leading-edge solutions must be engineered to accept retailers that can send store order forecasts, as well as retailers that require suppliers to calculate the multi-level demand signals. REY-MARSTON: The conversation today goes beyond what types of data can or have been incorporated into modern consumer goods analytics. Most of our clients today can leverage both internal and external, structured and unstructured data. The key issue today is what to do with the data deluge — how to drive better decision-making, not just more insights and reports, but better actions at the point of decision in the business. Better decisions should translate into better performance, and in many cases our focus is how to map the available data to the specific questions to be asked and decisions to be made. It is not just a matter of what data is available and how to harvest it. Cognitive analytics in supply chain is about the specific data nodes that are mapped to specific decisions and questions. These decisions are very tactical, local and with a short-term horizon for some processes, but also very strategic and with a long-term horizon for other processes. That said, companies are making tremendous progress connecting into live conversations from their sales force, into email trails, text messages and content analysis, to find patterns of behavior and insights that can drive specific actions in the market shaped by unstructured internal data sources. KELLY: CG companies can benefit greatly from the data and insights that come from what we call an integrated IT ecosystem, which can include their enterprise resource planning system, warehouse management system (WMS) and transportation management system, among others. To help develop advanced analytics, we tie their WMS to online marketplaces, creating a direct connection between the sales channel and the fulfillment center. This creates real-time inventory visibility for customers through their WMS and shows product availability in the online marketplace for the end consumer. As data is aggregated across those systems, automated reports can be generated to help CG companies make informed decisions regarding their business — from the introduction of new products to the redesign or repackaging of existing ones. An experienced operations management team also oversees customer fulfillment centers and reports on key performance indicators to drive continuous improvement throughout the facilities. NELLA: It’s essential that consumer product companies obtain quality data. Otherwise, it turns into a scenario of “garbage in, garbage out.” So quality data is the first priority. The other key element for being data-driven is accessing data from all the nodes in the supply network. Eighty percent of the data needed to run your supply chain resides beyond your four walls — with suppliers and logistics partners. It’s essential to unlock that data and harness it to feed the analytics machine. And finally, turning this type of data into actionable insights is essential. It requires an ability to execute on decisions that optimize cost or value. The leading consumer goods companies are taking a business network approach to optimizing and transforming their global supply chains to support new top-line growth strategies while sustaining cost efficiencies.